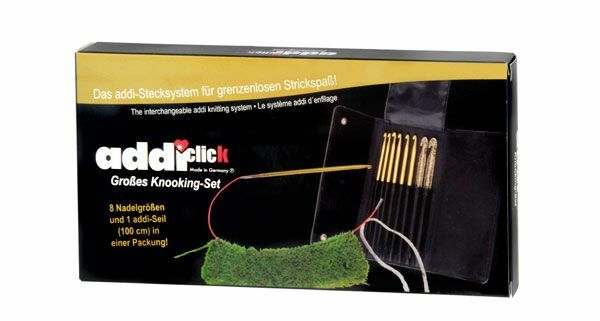 The large addiClick knooking set contains the set of hooks plus an SOS cord. A neat black case with KNOOKING SET of 8 ADDI CLICK Crochet Hooks (metric sizes 3.5mm, 4mm, 4.5mm, 5mm, 5.5mm, 6mm, 7mm, 8mm) with one 100cm red SOS ADDI CLICK cord. Thread the eye of the SOS cord with yarn and you can draw it through the loops on your hook...now you are knooking! This is a versatile set of 8 crochet hooks - there are 6 gold metal hooks and two larger glitter plastic ones (which will connect with all ADDI Click cords) along with one long 100cm cord. Designed for use as a Knooking Set, but also great for Tunisian or Afghan crochet. Quality products from ADDI, made in Germany.